It’s a solid form of wood, plastic or metal on which a shoe is built, and which imparts its shape to the shoe. 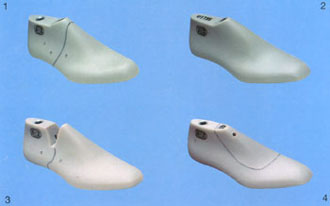 The fit of a shoe depends on the design, shape and volume of the Shoe Last. A mass production system needs a high number of last of the same grade to put in a high capacity production chain but have a limited number of grade. 1) LAST WITH SHOE HINGE "TENDO"
3) HINGED SHOE LAST "ALFA"